Happy Wednesday! I am busily preparing for the Lucketts Spring Antique Market (May 17th and 18th) and cramming in as many projects as possible before it’s too late! 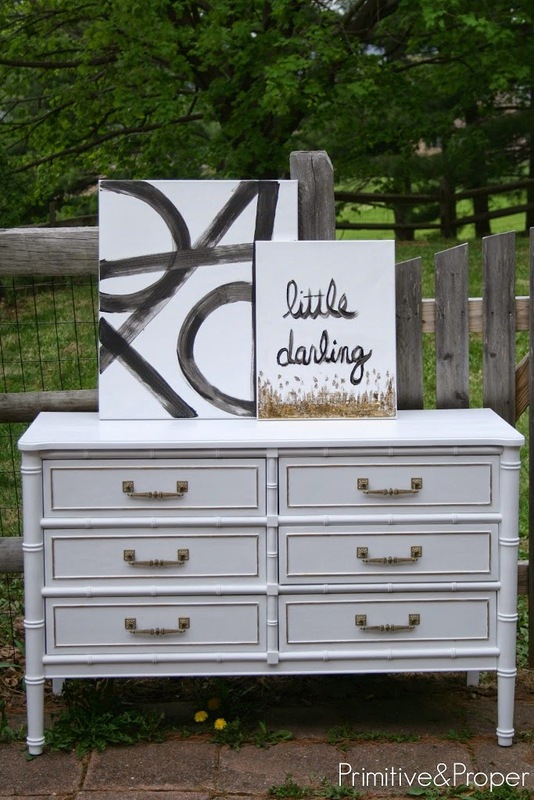 This dresser is one that I picked up last week because I specifically wanted it for Lucketts. I had actually found it on craigslist a few weeks prior, but was told that someone was ahead of me…. it was so gorgeous and inexpensive that I knewI had a slim chance. Out of the blue, the seller emailed me last week and said the first person had repeatedly not shown up and if I could come get it, it was mine! I did a happy dance and made my plans for it! I didn’t snap a before picture, so I am borrowing this from the seller. I loved its shape and bamboo details. 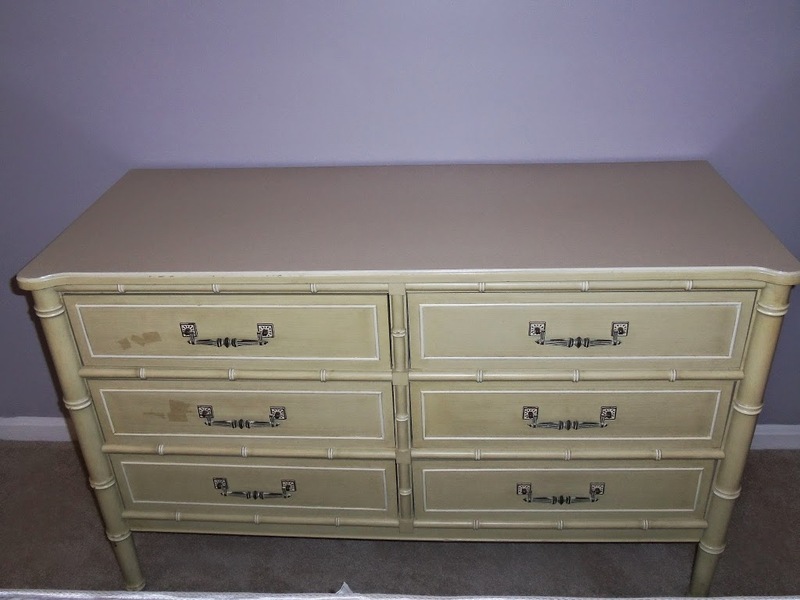 I did not love the yellow finish, laminate top, and scotch tape on some of the drawers. I knew I wanted a clean and glamorous look for this girl. I started by sanding it all over as much as I could. I sanded down the laminate top just to remove shine, and give the primer something to stick to. I sanded the sides with my orbital sander, and hand sanded the rest as the details were too hard to hit. To prime it, I used a combination of two products: Kilz Adhesion Primer and Kilz Complete Aerosol Primer. Since the adhesion primer is meant for harder to prime surfaces, I figured it would be perfect for the laminate top. It worked like a charm on the top, sides, and drawers, which had been sanded well. However, I tested an area of the trim, and it was not sticking as I had expected it to. That’s when I pulled out the spray primer, which is oil based. It smells, but it will stick to almost anything! I will say that what I love about the adhesion primer is its thickness for a water based primer. It’s not as translucent as some that I have used- it gives a nice solid finish. I ended up applying two coats, only because I’d rather do an extra coat of primer than an extra coat of paint! Once the primer was dry, I lightly sanded the piece all over so that it was smooth. I then applied two coats (allowing dry time in between) of General Finishes Snow White Milk Paint. For some reason, I notice that this particular color has a bit more sheen than the others, which was exactly what I wanted. I also wanted to make sure this piece stayed its pre snow white color, so I did not top coat this piece. I do know that this is not the recommended practice, but I am basing my decision off of my own experience. My own dining room sideboard is painted in General Finishes Snow White, and I did not topcoat that either and it has held up perfectly! Meanwhile, as the paint dried, I was busy inside applying rub n buff to the hardware. It was quite worn and dingy and needed a little more shine- such a simple fix but it makes a world of difference. I also added rub n buff to the raised details on the drawer fronts. 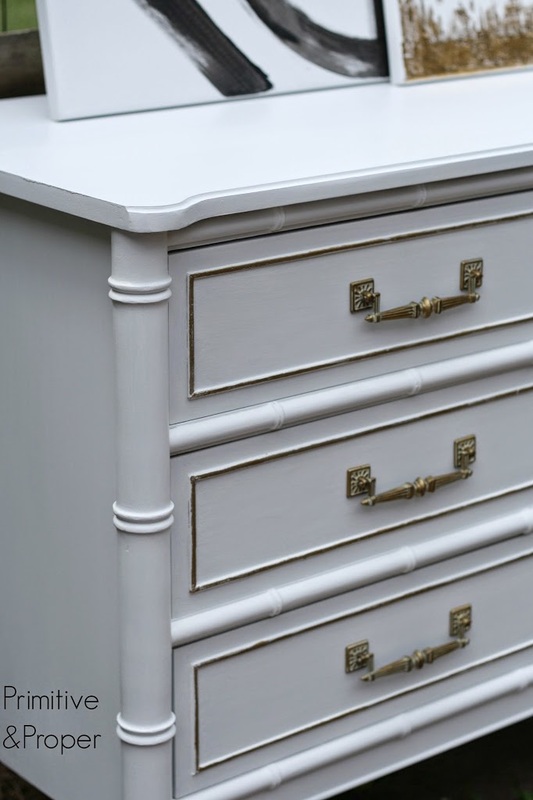 And I thought about adding it to the bamboo details like Kathy did on this lovely pink dresser, but then I thought to myself, “Put down the gold, Cassie. Walk away. Enough is enough. Stop gilding all the things.” Ready to see the afters? I love the hardware in its new updated gold! These details make my heart go pitter patter! Please ignore the dandelions and poorly maintained grass…. I am trying to distract you with a pretty dresser. Is it working? Did you notice something else? I created some modern art which will also be headed to Lucketts! I hope to share that with you Friday! For now I am off for an early morning run with my main man, Sawyer, who is soon to run his first 5k with me! Wish me luck! Perfection! Enjoy your day, Cassie! I love this so so much! I have been dreaming of finding a dresser like this. It’s so pretty. It is beautiful, and I love what you did with the hardware. I think the dandelions add charm to the photo! 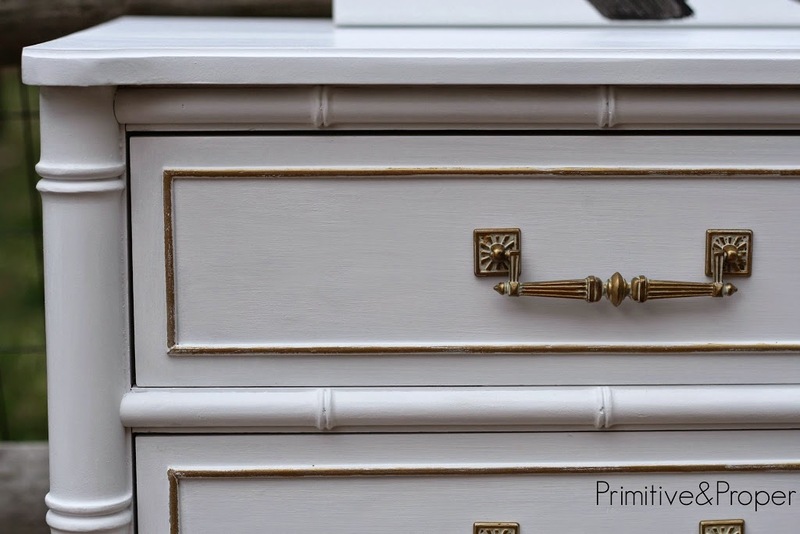 This dresser turned out fantastic! It looks amazing and love the art too!! Love the bamboo details! So perfect painted white! Oh what a lucky find and you really made it shine! Love the white and gold combination! Great find and transformation! I love the gold accents on the white. GORGEOUS! 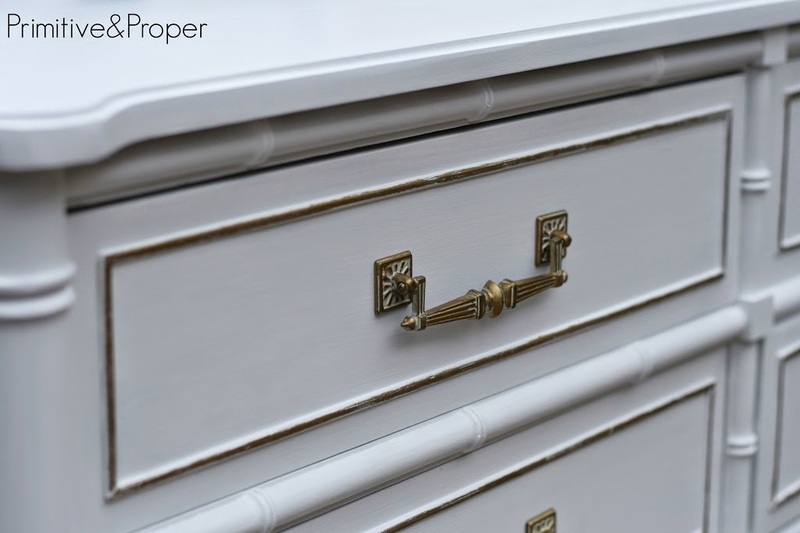 Love the hardware & I am using that same white on a project right now! The dresser is like Cinderella! One of the best before and afters ever! 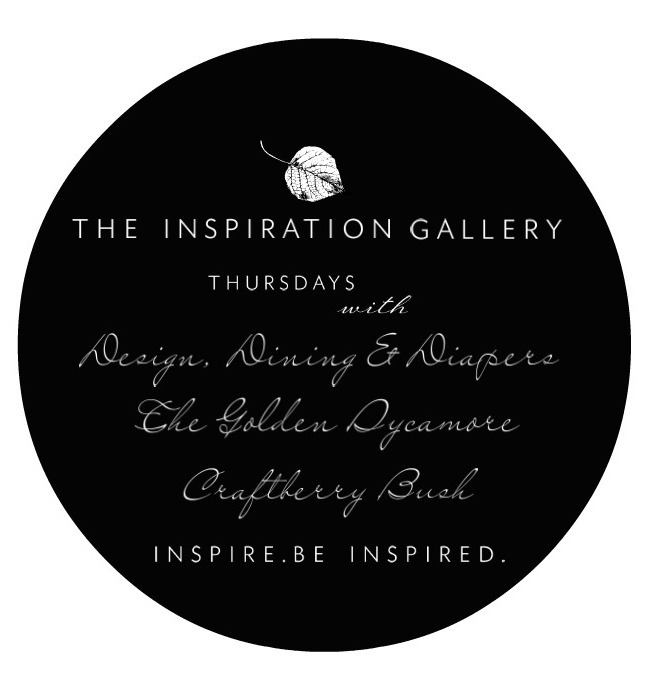 White and gold and bamboo – love them all together! Such a great score, glad it all came together for you. CL shopping is so stressful sometimes! Love this piece! in fact I have it’s partner nightstand under a pile in my sunroom!! I should send it to you since I probably won’t get around to painting it anytime soon…but maybe your dresser will be the motivation I need. I miss ya Cassie! It looks great as always. Love the gold details on this piece. That looks like a Henry Link! Those go for big bucks out my way. Nice find and great paint job! this is one of my favorite pieces that you have done! I’m a sucker for anything bamboo! I love this!! I want it. whaa. Every time I see this bamboo furniture, I smile. I had the full bedroom suite in the light blue, back in the late 60s, early 70s. It was very haute then. I recall the top being very durable, perhaps a formica? I loved the stuff. Year’s later, (decades) my 70 yr old mom moved in with her boyfriend, who had the yellow suite in the guest bedroom. Same era. I love how you’ve given this such a fresh, rather regal look. Great job (again!)! The gold and white combo is lovely! I think the gold is the perfect touch! love it! 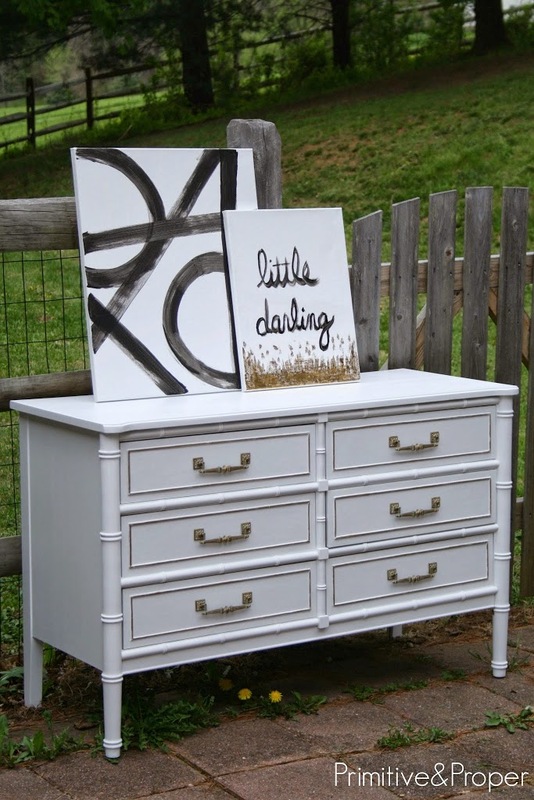 Cassie, I have this identical dresser. In fact, I have the entire bedroom set. It was purchased brand new 40 years ago for my daughter’s first bedroom. I still love it and it now is in my guest room. I, too, eventually painted it white, but left the Formica top as is. I have a corner desk with hutch, nightstand, bamboo headboard, and a cute 2-door bachelor chest with shuttered doors. The set was meant to be wrapped around the room. I now use the corner desk and hutch in my office. You might like to know that this furniture is called Bali Hai by Henry Link, Lexington, NC. I still love this furniture. Your piece looks great. I found it on Pinterest. so fun! i love this set!